CAPE is a transportable, tent-like cleanroom facility developed by researchers at the Fraunhofer Institute for Manufacturing Engineering and Automation IPA. It can be installed both indoors and in unexposed outdoor locations, and takes less than an hour to set up. The inspiration for this innovative new development came from a project with OHB System AG, one of the key players in the European space industry. CAPE helps to protect delicate parts during the manufacturing process as well as to avoid any cross-contamination. It also provides a controlled environment in which to sterilize equipment and components. Serving as a "cleanroom on demand", CAPE is the ideal solution for any industry needing to keep the production process free of contamination and yet not requiring any permanent sterilized cleanroom facility. Fraunhofer IPA will be showcasing the system at this year's Hannover Messe, April 1 to 5, 2019 (Hall 17, Booth C83). In many sectors, even the slightest contamination can have a detrimental impact on quality. Indeed, impurities and germs on automation components, tools, microchips, space probes, or medical devices can mean a defective finished product. To avoid these issues, companies typically use a cleanroom environment for any contamination-sensitive parts of the manufacturing and assembly process. The problem is that cleanrooms are expensive, not always available, and not guaranteed to protect against cross-contamination. Often the cleanrooms themselves need to be kept free of germs, as in the case of the assembly or maintenance of automation components. CAPE now provides manufacturers with a transportable, contaminant-free environment that they can use to achieve air cleanliness standards in compliance with ISO classes 1 through 9. As well as supplying a cleanroom environment to provide maximum protection against contamination in the production process, the tent-like structure is also a sterile space. Companies can set up CAPE in their production halls or even outdoors, provided that the facility is placed on solid ground and that there is sufficient protection against the elements. Fraunhofer IPA is able to tailor these "cleanrooms on demand" to the specific requirements of the individual customer and their production process, offering a range of designs, shapes, and sizes – with or without floor, for instance. Moreover, CAPE can be rapidly integrated into existing production zones within a manufacturing operation without the need for any structural modifications. The smallest version available measures just 30 x 30 centimeters. This is perfect for processes such as soldering, for instance, where only a small area requires protection.The tent-style version weighs 60 kilograms and measures 3 x 3 x 4 meters. 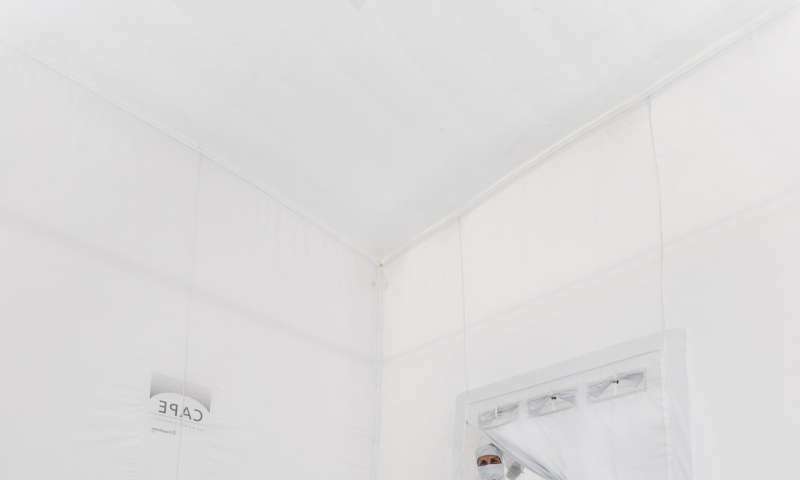 CAPE has walls made out of special low-outgassing, washable, and sterilizable fabric that can be lowered from the ceiling like a mosquito net or built from the ground up. The fabric cover is attached to a double frame made of CFRP tubular segments, with aluminum connectors that lock into place without tools. The CAPE is extremely fast and simple to assemble, without the need for tools or other aids – a huge advantage that eliminates material costs and saves time. The 3 x 3 x 4 meter version takes just 30 minutes to erect, for instance. "We can set up the 11 x 12 x 7 meter facility in one to two days. Compare that with a conventional cleanroom of equivalent size, and you would need one to two months," says Dr. Udo Gommel, head of Fraunhofer IPA's department of ultraclean technology and micromanufacturing. "What's more, companies save themselves the running costs of when the cleanroom is not in operation," continues Gommel as he explains the advantages of a portable system that is as compact as a tent. This is a particular boon for customers who do not require a permanent cleanroom environment.The system is transported in a sturdy aluminum box that can be sent by air freight. CAPE complies with the most stringent air cleanliness standards, including ISO class 1. ISO class 1 dictates that, in each cubic meter of air, there must be no more than 10 particles more than 0.1 micrometers in size. This is an ultra-clean environment that is some billion times cleaner than the air we usually breathe. The researchers have developed their own ventilation system to ensure a sterile production environment. "Our air distribution solution, complete with filter system, ensures homogeneous flow distribution and directed flow guidance. That's what sets us apart from other systems on the market. CAPE's fabric cover is permeable, non-outgassing, and electrostatically conductive, ensuring an even radial flow of air from the inside to the outside. By manipulating the relative air pressure and reversing the pressure gradient, we can safeguard either the interior of the tent or the zone around it as we choose," says Gommel. "Extensive testing has proven that CAPE produces no chemical emissions." The applications of such a lightweight, transportable system are manifold, with the potential for this "cleanroom on demand" to be used in sectors as diverse as chip manufacturing, medical technology, the food industry, satellite assembly, and even the automotive industry, where it could be used in the manufacture of battery and fuel cells. "CAPE can even be used in disaster zones, providing a clean and sterile environment in places where there is no other operating theater available," says Gommel. The Fraunhofer IPA research team will showcase a fully functioning version of the smaller-size CAPE system at the Hannover Messe from April 1 to 5, 2019 – come and meet them at the joint Fraunhofer booth C83 in hall 17.